This blog was contributed by guest author Arjan Van Proosdij from Veritas. Got Back Up? Anyone who has a basement or even a closet in their home, knows the sometimes painful necessity of clearing out space and managing storage. Government agencies embarking on digital transformation can also feel the pain of runaway costs due to storage accumulation for backups. With Veritas NetBackup 8.1 in Azure Government Marketplace, get the benefits of CloudCatalyst for de-duplicating your cloud storage, for efficient space management in Azure Government Trusted cloud! Technical and business decision-makers in public sector organizations told Veritas in the recent Truth in Cloud research study that expanding their use of the public cloud as an alternative to in-house applications and infrastructure is a significant cost-reduction driver. 20 percent expect their investments in cloud technology to be 20 to 25 percent of their total IT budget by 2019. They also expect budget allocations for cloud technology to increase an average of 58 percent in the next year. 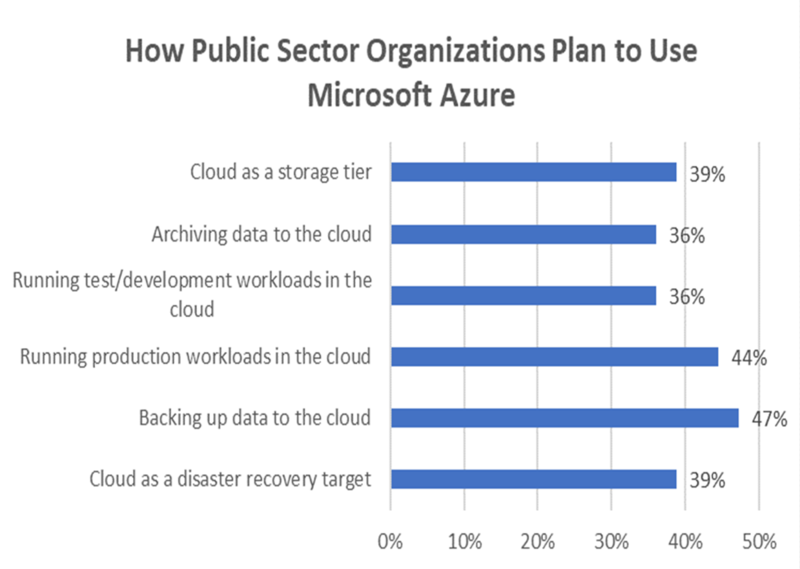 Our research also found that nearly half of government organizations are leveraging the cloud with Microsoft Azure, and data protection is at the top of their use-case list (see Figure 1 below). Traditionally, backup repositories at government agencies hold a significant portion of their storage footprint, most of it in expensive primary storage or large tape libraries. Moving non-production backup copies to a more economical, durable, and secure offsite cloud storage repository can help reduce on-premises storage and data center infrastructure expenditures. In addition, you can gain agility with cloud storage. For example, a warm offsite backup copy can be used for disaster recovery, testing/development efforts, or data analytics by effortlessly combining cloud storage and cloud computing. In other words, unlocking business value from otherwise under-utilized data. Today, many enterprises still use tape media for backup. Although tape is excellent for long-term retention, it’s not ideal for fast data recovery because of the time it takes to retrieve data copies from an offline, offsite tape warehouse. Likewise, backup success is difficult to verify, and media management is required to ensure freshness of the backup data which also costs you time and resources. If you want to more quickly and cost effectively deliver faster recovery-time-objectives and require reliable recoveries, then a better option is to keep backup copies online in Azure Government for 24/7 on-demand access and speedy, on-the-network recovery. It’s a big step to move your data into the cloud, so before you push your backup copies out to Azure Government, you need to understand what type of data you have. That includes identifying which data can safely live in Azure Government and which should stay on-premises (such as data that needs to be close to critical production applications). For backup copies that transfer to the cloud, utilizing the latest encryption and key management technologies are essential to preserve and control it. 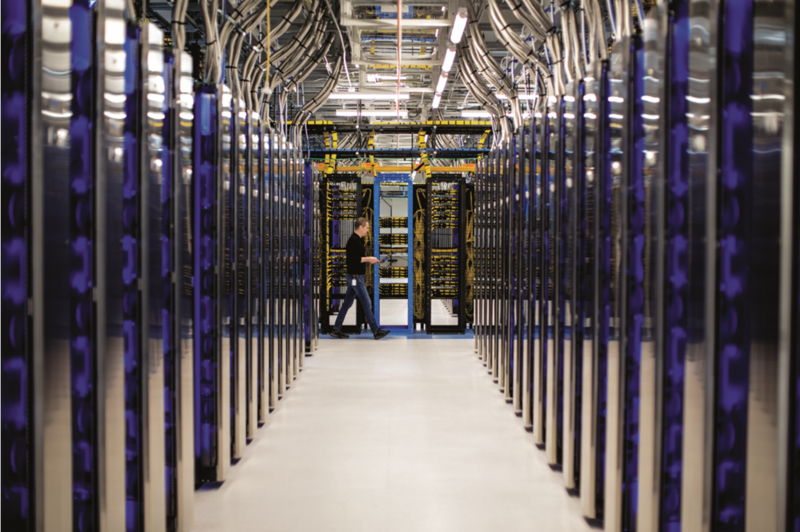 IT environments are no longer confined to the data center. They’re now comprised of legacy and modern applications that run on on-premises private clouds and multiple public clouds. Protecting data across these fragmented environments can be cumbersome and painful. Therefore, we recommend you consolidate the numerous point-products that make up your backup architecture into a unified data protection solution that can seamlessly scale with your IT and cloud strategy. In order to drive down the total cost of ownership (TCO), you need to reduce the overall volume of data stored in the cloud by deduplicating backup copies. Managing data retention with automatic deletion of expired backup copies is another significant factor in controlling TCO. But there are many CAPEX and OPEX factors that comprise TCO such as network infrastructure, local storage, gateway appliances to transfer data to the cloud, specialist resources, etc. Investigate all these different, and often unique, elements to determine your TCO objectives and strategy. Tape hardware needs to be refreshed every seven to ten years. These are long-term and often significant upfront investments. The question you must ask is whether you can you commit to another ten years? Moving your backup copies to Azure means that you no longer have to worry about legacy tape formats or migrating large volumes of data to new hardware. Azure manages the hardware lifecycle and data migration. 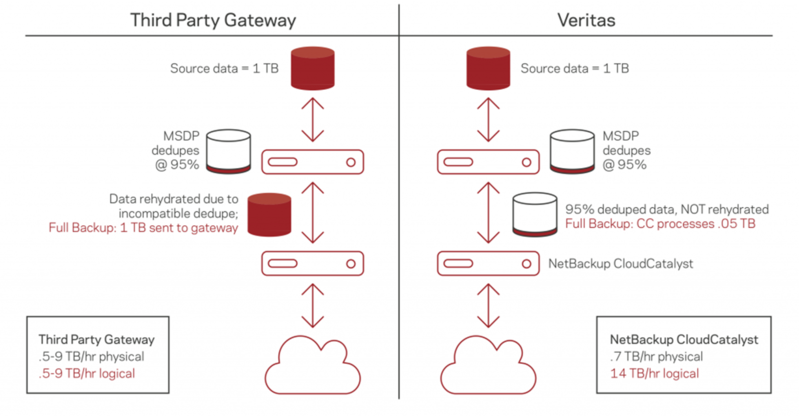 As part of NetBackup 8.1, Veritas offers NetBackup CloudCatalyst, a highly efficient deduplication technology that enables you to take advantage of cloud storage while saving money. It provides powerful end-to-end deduplication in the data center and extends backup data to Azure Government in its deduplicated format without rehydration or staging. Recovery of data can be performed directly from the CloudCatalyst which speeds up recovery. Figure 2: NetBackup CloudCatalyst gives you powerful end-to-end deduplication to reduce costs and realize better performance than competitors’ solutions. Source: Veritas internal benchmark study. Veritas provides deep integration with Microsoft Azure, so you can accelerate your cloud projects with all the benefits of unified enterprise data protection in order to realize seamless, automated data lifecycle management and governance. CloudCatalyst assures protection of data and applications in your data centers, remote branch offices, or the Azure Government Cloud. Get fast end-to-end deduplication performance with NetBackup CloudCatalyst to reduce time, cost, and network bandwidth for your cloud storage. Learn more about CloudCatalyst and visit the Veritas Truth in Cloud Report.